Live demonstration behind Beekind in Sebastopol. ABSOLUTELY NO REFUNDS OR DATE CHANGES ALLOWED AFTER MARCH 1, 2019. Please read terms before ordering bees. • BEGIN TERMS: When you place an order for bees you agree to the following terms. Refunds or changes on Bee orders will be charged a $35.00 cancellation or date change fee on each Package. • No refunds or cancellations are allowed after March 1, 2019. Package bees that are not picked up on weekend dates selected will be forfeited unless special arrangements have been made. • Bees are never shipped, however, shipping options form must be completed in order to process online ordering form. 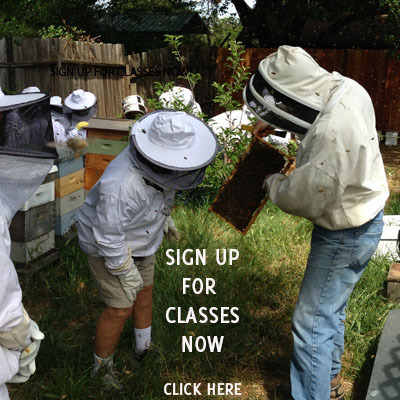 • Bees must be picked up at the beekind store in Sebastopol, CA. • Package bees that are not picked up on weekend dates selected will be forfeited unless special arrangements have been made. • Orders must be made, and paid for, in advance of pick up dates, as we will sell out. • Please know that weather can affect delivery dates. • PACKAGE BEES: Your pick up weekend must be selected at time of purchase. • You can pick up your package(s) EITHER on Saturday or Sunday of your selected weekend. Pick up times are 10 am to 6pm on Saturday and Sunday only of your pre-selected weekend only. • CUSTOMER ASSUMES ALL RISKS CONCERNING THEIR BEES ONCE THEY ARE PICKED UP. BEES ARE LIVE STOCK AND ARE SUBJECT TO VARIOUS ENVIRONMENTAL STRESSES AND OCCASIONALLY BEES DO DIE IN TRANSPORT OR ABSCOND AFTER INSTALLATION. END TERMS. Three Pound Package with Local Queen. Locally adapted stock that have been untreated for several years living in California Coastal climate. The queen is open mated in Capay valley with commercial drones. $150 Includes non-returnable cage. Sold Out for Local stock. Three Pound Package with Italian Queen. Italians are ideal for a temperate Mediterranean climate and are known for their large numbers and ability to capitalize on early nectar flows. The queen is open mated in Capay valley with commercial drones. $150 Includes non-returnable cage. Sold Out for Italian stock. Three Pound Package with Carniolan Queen. Carniolans are ideal in a cooler or higher altitude climate and are known for their over wintering ability with small clusters. The queen is open mated in Capay valley with commercial drones. $150 Includes non-returnable cage. Sold Out for Carniolan stock.